Sports injuries and trauma cause damage to muscles, tendons, and ligaments. Whenever the cells are damaged they release inflammatory markers to trigger healing and cellular repair. We notice redness, swelling, and pain in the injured areas. 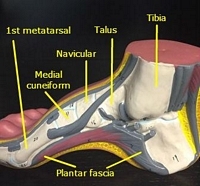 We can all picture a swollen ankle after severe sprain, the ankle swells within a few hours. Persistent injuries and chronic inflammation are common among athletes. Many athletes are producing low levels of inflammation from chronic injuries in their muscles, tendons, ligaments, and joints. They get back to their activities before the injuries are completely healed and further tissue damage occurs during activity. Low level damage accumulates and the amount of inflammatory chemicals increases. Low level lasers are a great treatment for reducing both the short term acute inflammation and the long-term inflammation from chronic injuries. We have seen on the news many professional sports teams and athletes using low level cold lasers to treat inflammation and enhance recovery. Specific laser frequencies block pain receptors. As athletes pain and inflammation disappears they can return to their sport quicker than with just traditional treatment alone. Many of these athletes are commonly combining these treatments with deep tissue therapy, massage therapy, Graston Technique, or Active Release Technique (ART) to enhance the muscle and tendon healing. 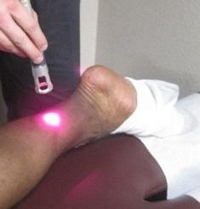 Low-level lasers are also an effective treatment for acute and chronic injuries because of their role in enhancing cellular repair and tissue healing. Accelerating healing processes helps athletes return to the field faster. Laser therapy is a great treatment for bursitis, jumpers knee, iliotibial band, tennis elbow, achilles tendinitis, or chronic pain in the fingers, wrist, and elbows. Several studies have shown the role low-level lasers play in decreasing pain in the neck, back, shoulders, elbows, and knees. They have positive effects on exercise-induced muscle fatigue and biochemical markers related to post exercise recovery. From a treatment standpoint, lasers are a great adjunct therapy to traditional chiropractic and physical therapy treatments. They enhance all muscle techniques and treatments. Class IV cold lasers are excellent treatments for those hard to reach and awkward areas around the shoulder, elbow, wrist, and fingers; where traditional electric and ultrasound treatments are less effective.